Sometimes the concept of "innovation" can be overwhelming, but I like to keep things simple. I have distilled what I think are the steps you need to take to ensure successful innovation and outlined them in a simple framework which can be used as a tool for discussion in workshops. This framework covers vision, strategy, process, checklist for successful innovation, mindset and provocative questions to help get the ideas flowing. All elements are detailed below, and the full high res version can be downloaded at the bottom of the page. ﻿There are now thousands of definitions of "Innovation" and it is probably the biggest buzzword of 2015. Google it and you'll be overwhelmed by the different definitions available now. My own broad definition of innovation is "fresh new ideas that create lasting value". But did you know that 98% of innovation FAILS? So I think what is more important than the definition of innovation, is what is the definition of SUCCESSFUL INNOVATION and how do we ensure innovation doesn't fail. My own definition of successful innovation is "fresh new ideas based on a strategic growth area and a strong consumer insight that create long term value". It's important to note that innovation is NOT just product or technology innovation. Innovation can be Content, Product, Distribution, Service, Funding, Business Model, Relationship, or Technology based. Some examples of my innovation successes. Before you read about how I approach innovation, it's probably a good idea to show you some of my achievements in innovation to show how this approach has worked for me i.e its not just words on a piece of paper! The science behind EPIC costume creation. A NASA level scientific approach that creates, tests, and tweaks hundreds of costume ideas to deliver innovation in costume design, through a network of global costume wizards and crowdsourcing ideas. 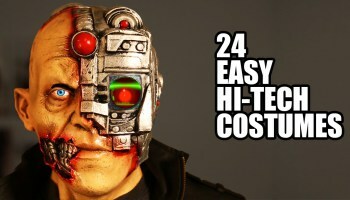 Digital Dudz - the high tech halloween costume covered by 20+ major TV stations across the globe. The world's first "pop-up" and world record breaking costumes - Tetris! Ariel Stain Remover launch in 2010 - £15million sales in the first year. 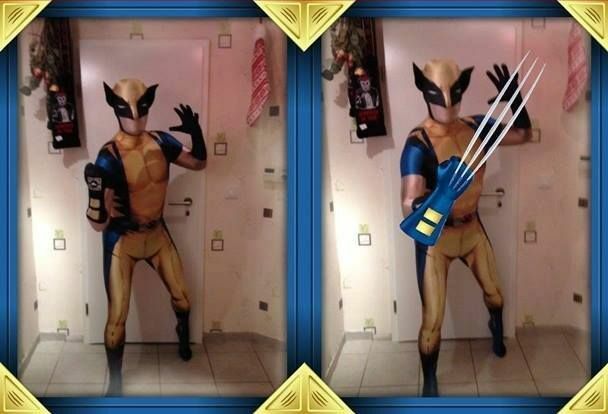 The world's first augmented reality costumes - and securing the Disney Marvel license. Partnering with Youtube superblogger, Magic of Rahat, on a line of prank costumes that achieved 5 million views. Introducing automated dashboards for reporting to save time pulling data and improve efficiency. Introducing automated budget tracking in SAP for all UK P&G brand managers - rolled out across EMEA. Just like every other element to your organisation, the first port of call with Innovation is defining the vision and strategy. What are you trying to achieve and how are you going to get there? Show how each project fits into the top level organisational strategies. Focus which consumer segments you will be targeting. Outline the type of innovation i.e product, service, distribution, business model, relationship, technology. Identify the scope of the project i.e. incremental vs. disruptive vs. test innovation. Identify any resource or capability gaps in advance so you can put a plan to address them early. Outline the size of the prize and the funding needed to deliver the projects. Keeping things simple - try this approach to innovation which covers all the important bases. I have also added in some helpful questions you can ask when thinking these steps through - either in your team or in an innovation workshop. 98% of all innovation fails. Scary number. This is normally not because the idea is terrible, but because one or more key steps in the process have been missed and result in no sponsorship, no investment, no strategic alignment, no internal alignment, unfeasible projects or poor execution. 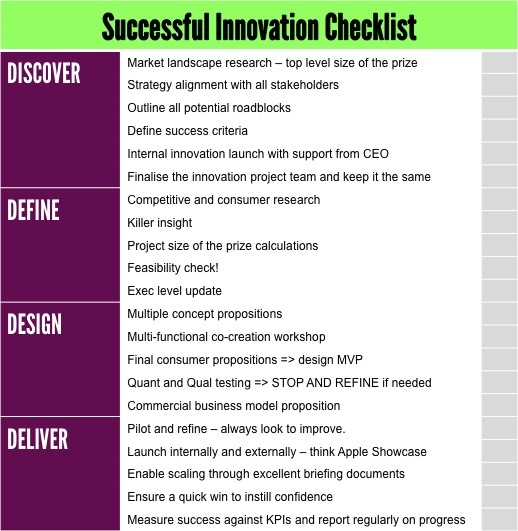 This is a handy checklist you should go through when launching any innovation project to avoid all of the above and make your YOURS doesn't fail. How to encourage an innovative culture? Nurturing a culture that allows for innovation is the key to sustainable innovation success, especially in rapidly growing companies (e.g. Google). But how do you do this and make it more than just words on a piece of paper? Strive for continuous improvement not instant perfection. Dare to begin before you're ready. Be clear on your innovation mission and identify where to focus attention. Get everyone on-board at all levels of the organisation - take them on the journey. Disrupt the thinking. Get different people working together. Change the environment. Get people out of their comfort zone. Have a clear Mission - at Morph it is "To be the most innovative and impactful costume company in the world" or "The Google of the costume world". Give out a monthly Innovation Award to people across the business who have come up with fresh new ideas to create value. Make it a physical trophy that people proudly have on their desk. Get other employees engaged in thinking with an Innovation Ideas Board - either physical or digital using an app like ConceptBoard. Incentivise ideas if you can! Use your ​Business Cards in an innovative way to get external attention but also make your employees proud to be a part of the business. Hold internal Innovation Sessions where you share what work is going on and get other people involved - always use "Work in Progress" to make people feel like they can contribute. Coach your team on "creative thinking" - give them frameworks to work from rather than starting from scratch. Encourage blue sky thinking and cross department collaboration. How to "begin" thinking about innovation? Where to start? The hardest part about innovation (once you've decided to GO FOR IT) can be knowing where to start. For me this always starts with your mindset, and here is how I separate out the traditional innovators vs. the disruptive innovators. 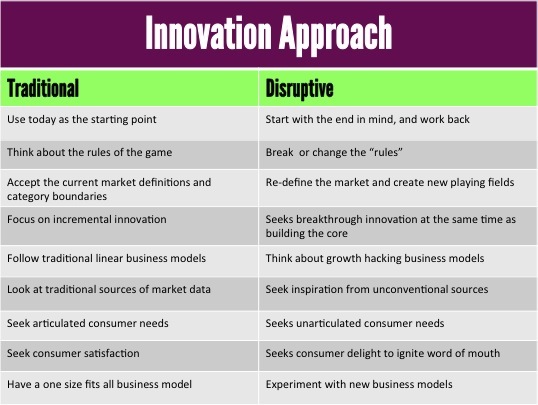 The main differences between the traditional and disruptive innovators is their approach to how they limit their aspirations, define their market and category, where they look for sources of inspiration, and what they are willing to change. What questions can help to get the ideas flowing? The second step once you've got yourself in the right frame of mind is to look at a set of open ended questions to help get the juices flowing. The ideal way to do this is with a workshop in a creative environment with a mixture of important stakeholders and new employees, internal and external brains, experts and complete novices, brands and consumers. What innovation tools can I use to help? One innovation tool which I find useful is based on the "what if?" or "if only" question or "wiio". This is based on the revolutionary approach to breaking the category rules and can be a good way to ignite disruptive innovation. You start by listing all the accepted facts or rules of the industry or brand. How things are normally done. How things are expected to be done. Things people accept to be the "norm" and "rules of the game". Then for each one you go through the exercise of saying :"what if..." or "if only..." and see where it takes you. The following step after using this tool would be to say "This could happen IF x, y and z were to be true". And then you do a feasibility check to see if these factors are currently possible or if they might be possible within the next 3-5 years. the practice of finding exponential upside to investment. What do you need to be a growth hacker? Hybrid set of skills including marketing, product development and a mathematical brain. You need to be both a data geek AND creative. You must obsess over data and measurement and think of out-of-the-box solutions. Ability to analyse and optimise to drive scale quickly. Be curious about everything around you and how you could use it to drive scale. Be brave. Make, launch and fail quickly. The entrepreneur revolution has turned scale on its head. Start-ups can now do what companies could do, companies can now do what multi-national companies could do, multi-national companies can now do what governments could do. This is very empowering for the underdogs who, if they believe in the power of growth hacking, are not restrained by their current size and capability but know how to use the "sumo move" and use their competitors size and weight against them. Growth hackers see resource constraints as an opportunity to do things differently and create an unfair advantage by leveraging asymmetries in the market. Innovators vs. Growth Hackers vs. Challenger Brands. Challenge the status quo and think differently. Think about how resource constraints can be turned into an opportunity. Are not limited in their ambition by their current size. Look beyond their current industry for inspiration. Enter your email address to get your FREE download of the 7 Steps to Success. We will keep you informed of related products and news.